Ten days from today, these three happy monks (l. to r. D. Elijah, D. Finnian, Br Cassian) will set out for Częstochowa. 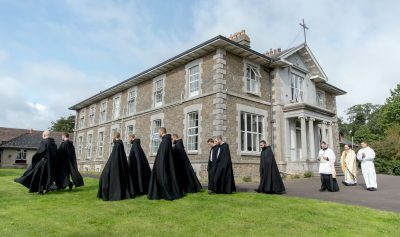 Silverstream’s three pilgrims will walk with the Traditional Latin Mass Society of Warsaw (Warszawskie Środowisko Wiernych Tradycji Łacińskiej) from Warsaw to Częstochowa. While in Poland they will visit some of Poland’s Benedictine monasteries.